This entry was posted in Auto Insurance, Auto Insurance News, Blog, California Car Insurance, Car Insurance, Car Safety Tips, Travel Insurance on 06/07/2017 by Alejandra Vazquez. Owning a recreational vehicle (RV) can be a great way to achieve a more nomadic lifestyle. RVs are also perfect for exploring the California coast. Some people choose to hop from one California state park to another, setting up camp and enjoying the Golden State’s natural beauty for the entire summer. Other people sell off their personal items and homes, living on the road and journeying across the state until they’re ready to settle down again. 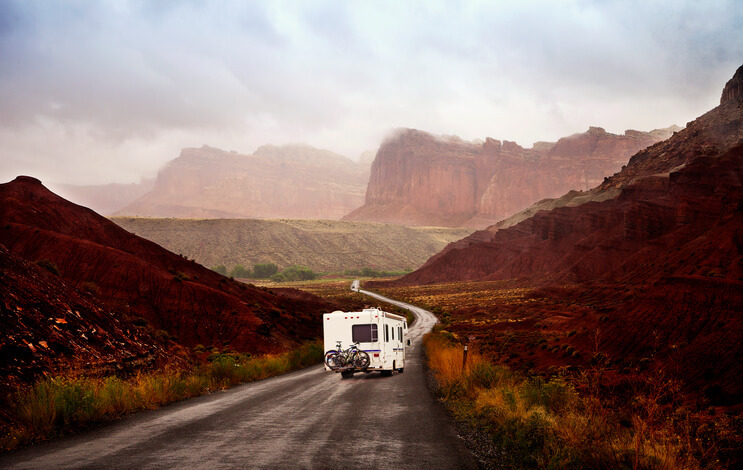 But before you set out on your RV road trip, be sure to compare motorhome insurance plans. Without proper protection, your RV adventure could lead to serious trouble in the case of an accident. It’s also important to know that not all motorhome insurance policies are created equal. You want to get the best coverage you can reasonably afford. Here’s what you need to know about RV insurance and how you can get the right coverage for your California RV roadtrip this month. RV insurance isn’t the same as regular auto insurance, however; it does offer many of the same protections, such as collision, comprehensive, and liability coverage. It also provides roadside assistance in case your motorhome breaks down or you get into an accident with another vehicle. That being said, there are some key differences between basic auto insurance and motorhome insurance. For example, motorhome insurance quotes will be significantly different for RVs of different sizes. Motorhomes range in size, with Class As being the largest, Class Bs being the smallest, and Class Cs encompassing everything in between. Unsurprisingly, the larger and more expensive your RV is, the more insurance it will need. Remember to consider the cost of your monthly premium when you’re weighing which RV to buy. Class A vehicles will require a substantial amount of insurance, and that extra monthly cost might make it less affordable for you. Depending on the kind of RV insurance you get, the plan may also cover all of the personal belongings you store in your motorhome. This critical form of coverage protects you financially against theft. Should someone steal your personal items, your motorhome insurance will reimburse you. Be sure to have an inventory of the personal items you keep in your RV, and send a recent, updated copy of that inventory to your insurance company. Talk with an insurance agent to verify that everything is covered. If anything isn’t included in your RV insurance, talk to your insurance agent about getting a floater plan for expensive items. Before you hit the road and explore California this month, make sure you have the motorhome coverage you need to protect you and your vehicle. Freeway Insurance offers several different kinds of motorhome insurance for Class A, B, and C vehicles. We also can insure your towing trailer. To learn more about our motorhome insurance coverage, contact a member of our customer service team today at (888) 443-4662. We’re available to answer your questions about RV insurance and find you motorhome insurance that you can afford. You can also visit our website to get motorhome insurance quotes online.